When the sun boldly arrives after the winter turns into a tentative spring, tomato and basil plants applaud in the verdant fields; short sleeves and shorts become the de rigueur apparel; runners, swimmers and bikers flex in abundance; and everyone wants to be outside and schedules vacations appropriately. That's why music festivals--and increasingly jazz parties--beckon and have attracted large crowds chilling out to the most sublime performances on the planet. In the past two decades, jazz has become a dominant summer concert phenomenon--ranging from the granddaddy of all jazz festivals (on July 29-31 Newport in the ocean beach magic of Rhode Island celebrates its 62nd anniversary) to a relatively new jazz event on the north shore of Boston: the Rockport Jazz Festival celebrating its fifth year. All of the European jazz festivals have been forced to book "beyond jazz" acts from the pop and rock worlds to draw in large audiences and increase revenue (some may suggest just to break even). But remarkably in the Northeast, the foremost jazz festivals have showcased just that: jazz in all its stripes and colors. Most take place outdoors with a scattering of stages and amphitheaters. Some, like Rockport's party, take the celebration inside to a state-of-the-art theater with amazing views of the outside surroundings. While New York boasts an amazing array of jazz (and beyond) festivals--some free, some ticketed--it's always a healthy exercise in leaving the frenetic city and traveling in a relaxed pace to a destination where the soul and spirit in music presides. So here is a five-pack sampling of the premiere jazz festivals in the Northeast (comprising top-tier venues such as Rockport, Massachusetts; Newport, Rhode Island; Caramoor in Katonah, New York; Tanglewood in Lenox in the Massachusetts Berkshires; and Freihofer's Saratoga in Saratoga Springs, New York. • Freihofer's Saratoga Jazz Festival (June 25-26): Located just north of New York's state capital Albany, Saratoga Springs is a small town with big culture. It's well-known for its mineral springs which is a major draw for city slickers seeking a restful resort. It's also a major player in the thoroughbred racing world at its Saratoga Race Course (founded in 1863, it's the longest continuously operated sporting event) and also features harness racing at the Saratoga Casino and Raceway. But leave the ponies behind because the arts flourish in Saratoga in the summer. It's the home of both the Philadelphia Orchestra and the New York City Ballet. On the jazz front, there's the impressive Freihofer (sponsor) jazz weekend which has been drawing fans since 1978. The fest, which starts at noon each day and continues to the evening, takes place primarily at the ticketed covered, open-air amphitheater Saratoga Performing Arts Center (SPAC) which seats 5,200. On the spacious lawn area (20,000 can spread their picnic blankets there) the main concerts can be heard while there's also the free outdoor Gazebo Stage. Headliners on the straight-up jazz tip include the Chick Corea Trilogy (the pianist with bassist Christian McBride and drummer Brian Blade) and singer Lizz Wright; on the fusion front the Steps Ahead Reunion and Pieces of a Dream; and for the more pop-oriented fare, the Isley Brothers and Smokey Robinson. At the fest the young internationally renowned pianist Joey Alexander celebrates his 13th birthday. • Caramoor Jazz Festival (July 23): Located just north of New York (an hour's drive or train ride), the historic and classical music-oriented Caramoor Center for Music and the Arts opens its 90 acres of exquisite outdoor beauty to its 23rd year of presenting jazz. While it's a one-day affair at multiple venues on the property and picnic lawns, there are a couple of other dates at Caramoor before and after the daylong bash of jazz. Pianist Fred Hersch plays at the outdoor Spanish Courtyard on July 9 and the young and celebrated vocalist Cécile McLorin Salvant performs with the Aaron Diehl Trio at the indoor Venetian Theater on August 6. All the jazz activities at Caramoor are presented in collaboration with Jazz at Lincoln Center, so you know the quality of jazz given voice here are top-notch. The big draw on festival day is the Chick Corea Trio (which plays in the Venetian) with the pianist celebrating his "75 Years of Jazz Piano" show with bassist Christian McBride and drummer Brian Blade. Earlier in the day at the theater there's the Ladies Sing the Blues show featuring Catherine Russell, Brianna Thomas and Charenée Wade. Known for spotlighting up-and-coming jazz acts, Caramoor this year features an array of lesser known but extremely talented acts, including trumpeter Etienne Charles and his Creole Soul band, saxophonist Bria Skonberg, harpist Brandee Younger (in a duo setting) and the Harlem Stride Piano Hour. • Newport Jazz Festival (July 29-31): Newport turns 62 this year. While it's not the world's longest running festival (Monterey holds the honors at 59) because impresario George Wein moved the event to New York due to local protests, the big show returned triumphantly in 1981. 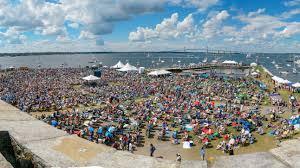 Its been the mammoth hit for jazz in the summer in the Northeast ever since, with its open-air stages in Fort Adams State Park (and some shows at the International Tennis Hall of Fame venue). The scenic Rhode Island festival has historically featured legendary recordings by the great masters of jazz, including Miles Davis, Thelonious Monk and Duke Ellington. This year the fest named bassist Christian McBride as the artistic director to work with Wein in putting together the who's who of artists who will play. While the taste had been acoustic in its early years, Wein and co. expanded the adventurous range of music that arguably fits under the jazz umbrella. This year is no exception with upstarts like Robert Glasper, Christian Scott aTunde Adjuah, Kneebody and the new rookie on the scene Kamasi Washington, there are plenty of shows by such veterans as Gregory Porter, Donny McCaslin, John Scofield with Joe Lovano, Charles Lloyd and Chick Corea. Special to the show this year will be a reunion featuring Dave Holland's longtime band with Chris Potter, Lionel Loueke and Eric Harland as well as an exclusive: The Bad Plus (expanded from its trio with horn players Tim Berne, Ron Miles and Sam Newsome) performing its take on Ornette Coleman's classic 1972 album, Science Fiction. All added up, there's no better and no more exciting jazz festival on the East Coast. • Rockport Jazz Festival (August 11-14): Located on Boston's north shore on the Cape Ann peninsula with nearby Gloucester in the east, Rockport is an aspiring artist's haven (not to mention home to a high number of lobster fishermen). The small, but extremely picturesque town is surrounded on three sides by the Atlantic Ocean. Featured in this quaint summer tourism spot is the state-of-the-art concert hall, Shalin Liu Performance Center, which overlooks the sea. As might be expected, given that Rockport is 35 miles north of Boston, this space features an abundance of classical music events (including the 35-year-old Rockport Chamber Music Festival June 3-July 10 and July 22). But five years ago, the center decided to stage its first jazz festival--unfortunately inside for the most part with its marquee players. This year's party features nighttime shows by trumpeter Terence Blanchard and his exciting plugged-in band E-Collective, post-bop saxophone star Ravi Coltrane, young Cuban pianist Harold López-Nussa and the master Hammond B-3 organist Dr. Lonnie Smith who will be playing funkified jazz from his new Blue Note Records album, Evolution. While the festival spans four days, this year in celebration of its five-year anniversary, Rockport Music has expanded its jazz offerings throughout the summer with superior shows: vocalist Dianne Reeves (July 15), Chick Corea Trio (July 25-26), vocalist Lizz Wright (July 29) and in its fundraising summer gala, Jazz at Lincoln Center with Wynton Marsalis (August 27). Quite impressive. • Tanglewood Jazz Festival (September 2-4): The key outdoor venue for the classical music community in an idyllic setting in Lenox in the Massachusetts Berkshires, the Tanglewood Music Center is celebrating its 76th anniversary this year. The longtime summer home of the Boston Symphony Orchestra, Tanglewood delved into presenting the top rock acts of the day in the mid seventies until neighbors complained about the volume. Since then, the esteemed music presenter has focused on classical as well as more low-key pop music and has expanded its jazz offerings. While jazz is offered throughout the summer in small pockets of the schedule (i.e., this year Chick the Corea Trio will perform on July 31 in the covered, open-air amphitheater, fondly called the Shed by the Tanglewood vets), since the early '90s the Boston Symphony fully gives over the venue to jazz during the Labor Day weekend. For a few years the festival was cancelled because of low ticket sales, but Tanglewood promises that the 2016 show will go on. While this year's lineup has yet to be finalized, past years featured Wynton Marsalis, Diana Krall, Ahmad Jamal, Roy Haynes, Nancy Wilson, Roy Hargrove and such masters as Miles Davis, Freddie Hubbard and Ray Charles. Dan Ouellette, Senior Editor at ZEALnyc, writes frequently for noted Jazz publications, including DownBeat and Rolling Stone, and is the author of Ron Carter: Finding the Right Notes and Bruce Lundvall: Playing by Ear. For all the news on New York City arts and culture, visit ZEALnyc Front Page.